Phyllis Akinyi is a dancer and choreographer based in Madrid and Copenhagen. She has studied flamenco for more than 14 years and has a deep love and respect for the traditional art form. Currently her work takes on a more choreographic and experimental form, in which she investigates her roots, as well as developing her own expression within flamenco. Nyar Kakan is Akinyi’s latest choreographic work. It premieres on January 25th 2019 at Bådteatret in Copenhagen. This work challenges the notion of belonging from the perspective and embodiment of a multicultural body, and fusions East African ritual dance, Scandinavian post-modern dance, and flamenco in one. Joining on stage is Swedish percussionist Stephan Jarl, who has co-developed the musical aspect of the performance. Akinyi has a series of site specific performances where she improvises with the given elements. These performances are usually done outdoors and often in nature. She works with the given sounds, as well as creating her own using her flamenco shoes. The latest performance serie was in Southeast Portugal (2018) where she did three performances. One in a marble quarry, one on a field, and one in a castle. She will return to do a fourth one in June 2019. 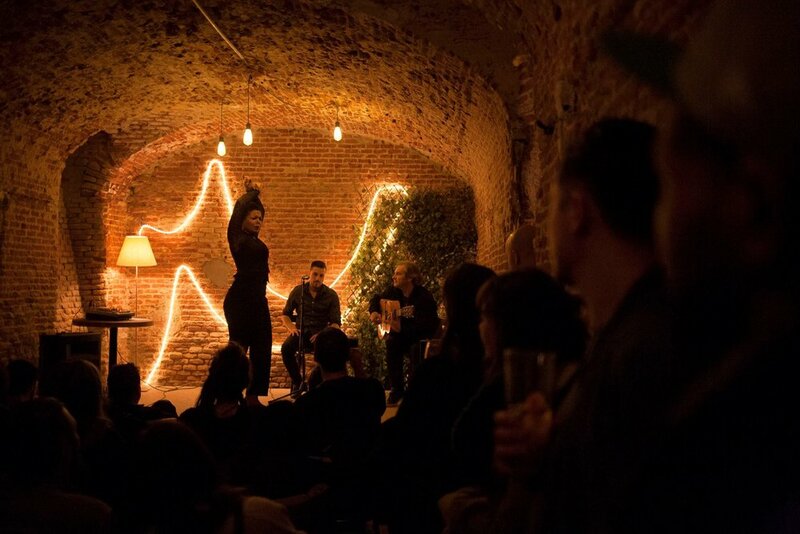 Flamenco45 is a ‘tablao’-style event in the heart of Madrid. Akinyi works with a flamenco ensemble to create an intimate setting where the audience can feel the intensity of flamenco in an authentic yet ‘modern’ way. We work with traditional styles while playing around with the flamenco ‘look’. Flamenco45 started in February 2017, and from February 2019 it will reinvent itself, bringing on a guest artist each time. Artists who are not necessarily in the flamenco world, but who are willing to improvise and ‘communicate’ on stage with us.